"These technology leaps are going to yield incredible miracles, and incredible horrors". From "Do You Trust This Computer?" In the April 6th story over at the Daily Mail which Steve Quayle highlighted on his website they report that according to Tesla founder and billionaire Elon Musk, if we continue traveling down the road we're on, we all will eventually be forced to serve an 'immortal robot dictator', whose power we can never escape, with Musk warning that AI which is created by authoritarian government's could very easily outlast the despotic individuals who created it. Warning once again that AI is a fundamental risk to human civilization in remarks he made in the new movie we've embedded as the first video below called "Do You Trust This Computer? ", Musk's warnings that the risk of AI will create 'a permanent system of oppression' sounds just like George Orwell's "a boot stamping upon a human face, forever". Warning also that AI will impact most people's lives in ways that we can't even imagine right now, in the 2nd video below from Sheila Zilinsky featuring Steve Quayle they discuss the 'gates of hell' that are now opening and why our world is rapidly going mad and as we're told by Steve who highly emphasizes this warning, "demons will most certainly inhabit AI", echoing comments made by Musk that in 'humankind' embracing AI, we've summoned the devil. As Musk tells us in the 1st video, "NOTHING will affect the future of humanity more than digital super-intelligence” and as we're told by another AI expert, "the general public is about to get blindsided by what's coming" and "there's nothing anybody can do to stop it". 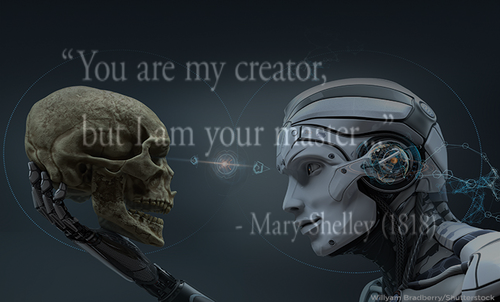 "You are my creator, but I am your master..."
While Elon Musk's calls for regulations for AI have been largely gone unanswered, all it takes for an 'AI arms race' to begin is one participant and as this Zero Hedge story reports, one South Korean university which had allegedly made plans to build killer robots has a group of AI researchers from over 30 countries boycotting the university. With robots actually replacing human soldiers in the 1st breaching exercise of its kind according to this new story over at Military.com giving us more proof that robotics are already being used in warfare and in an increasing number of different ways, the ZH story raises serious concerns over the introduction of 'killer robots' into society for good reason. The Korea Advanced Institute of Science and Technology (KAIST) and its partner, the weapons manufacturer Hanwha Systems, one of South Korea's largest arms dealers, are pushing back against the boycott, saying they have no intention of developing "killer robots" - even though the description of the project clearly states its goals, per the Guardian. "There are plenty of great things you can do with AI that save lives, including in a military context, but to openly declare the goal is to develop autonomous weapons and have a partner like this sparks huge concern," said Toby Walsh, the organiser of the boycott and a professor at the University of New South Wales. "This is a very respected university partnering with a very ethically dubious partner that continues to violate international norms." What's worse, the scientists say, is Hanwha's history of manufacturing and selling cluster munitions and other arms that are banned in more than 120 countries under an international treaty that South Korea, the US, Russia and China have not signed. 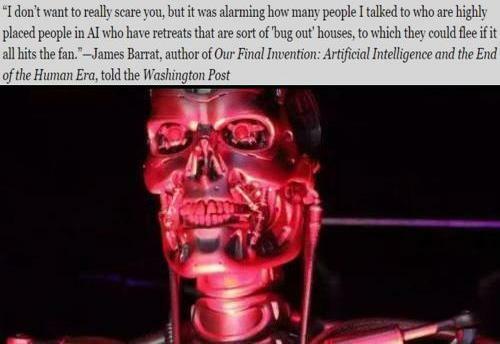 According to James Barrat, the author of the book "Our Final Invention: Artificial Intelligence and the End of the Human Era", it's quite alarming to him just how many people who are 'highly placed' in the AI field also have 'bug outs' to scurry away to should SHTF. As another AI expert warns us of in this video, with AI already taking jobs of millions of people across the planet, the end result could see mass unemployment leading to widespread chaos and social unrest. As Musk suggests, the implications that AI will have upon the lives of most are shattering when one considers what we're witnessing already with the opinions of conservatives already being censored by AI algorithms used by twitter, facebook and youtube. The internet was supposed to open repressed citizens' eyes, expose them to new democratic ideals and help them rise up against their authoritarian governments in declaring their basic human rights. It hasn't. It was supposed to be inherently resistant to centralized control. It isn't. In fact, in many countries, the internet, the very thing that was supposed to smash down the walls of authoritarianism like a sledgehammer of liberty, has been instead been co-opted by those very regimes in order to push their own agendas while crushing dissent and opposition. And with the emergence of conversational AI -- the technology at the heart of services like Google's Allo and Jigsaw or Intel's Hack Harassment initiative -- these governments could have a new tool to further censor their citizens. 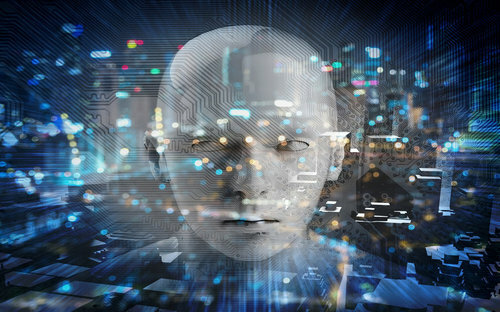 Scientific American recently put out a story titled "Will Democracy Survive Big Data and Artificial Intelligence?" within which they warned: "We are in the middle of a technological upheaval that will transform the way society is organized. We must make the right decisions now." Yet how many people even know that such decisions have to be made? The digital revolution is in full swing. How will it change our world? The amount of data we produce doubles every year. In other words: in 2016 we produced as much data as in the entire history of humankind through 2015. Every minute we produce hundreds of thousands of Google searches and Facebook posts. These contain information that reveals how we think and feel. Soon, the things around us, possibly even our clothing, also will be connected with the Internet. It is estimated that in 10 years’ time there will be 150 billion networked measuring sensors, 20 times more than people on Earth. Then, the amount of data will double every 12 hours. Many companies are already trying to turn this Big Data into Big Money. Everything will become intelligent; soon we will not only have smart phones, but also smart homes, smart factories and smart cities. Should we also expect these developments to result in smart nations and a smarter planet? Their story also warns that we as people are 'being programmed', where AI knows more about us than we know about ourselves, and as their story eerily points out, 'persuasive computing' is already here, AI ready to lead us off the cliff. 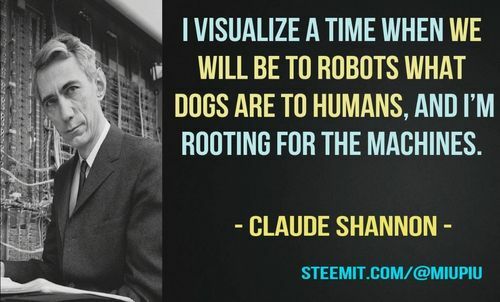 And as we see in the comment above from Claude Shannon, there are actually those rooting against the human race. Everything started quite harmlessly. Search engines and recommendation platforms began to offer us personalised suggestions for products and services. This information is based on personal and meta-data that has been gathered from previous searches, purchases and mobility behaviour, as well as social interactions. While officially, the identity of the user is protected, it can, in practice, be inferred quite easily. Today, algorithms know pretty well what we do, what we think and how we feel—possibly even better than our friends and family or even ourselves. Often the recommendations we are offered fit so well that the resulting decisions feel as if they were our own, even though they are actually not our decisions. In fact, we are being remotely controlled ever more successfully in this manner. The more is known about us, the less likely our choices are to be free and not predetermined by others. 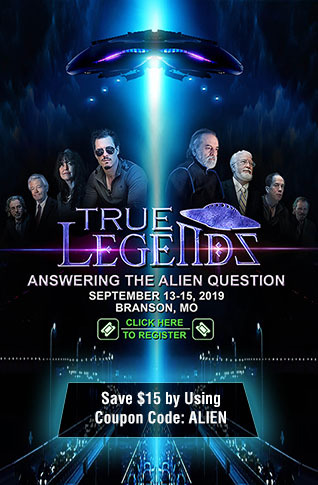 As we hear in the 2nd and final video below featuring Steve Quayle being interviewed by Sheila Zilinsky with their conversation on AI starting at approximately the 28 minute mark, most do not understand what we're now dealing with with AI and the potential for things to go horribly wrong with this new technology are being vastly underestimated and totally misunderstood by most. As we reported in this story on ANP back on March 30th, the mad rush towards transhumanism as man merges with machine and the 'internet of things' comes to life will be the end of humanity as we know it. As we hear in the 1st video, with AI programmed by people, both good and bad people, there's no way to avoid AI with 'bad intentions'. As Steve warns us, 'dark and disturbed AI' will certainly be unleashed upon humanity as they move towards robotic tyranny. Also discussed prior to the segment on AI are the mad rush towards World War 3 that we've been witnessing, the ongoing censorship of conservatives and the attempt to disarm law-abiding American citizens now being made by many on the left. 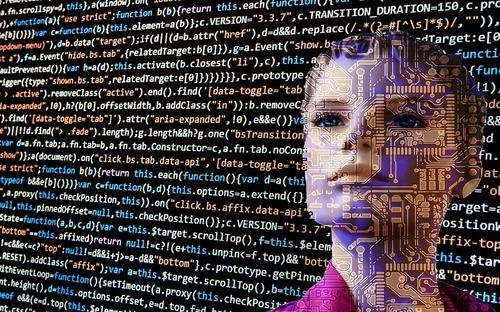 Are you prepared for the arrival of artificial intelligence? One interesting and ironic side note. Should an EMP, cyber attack or massive solar flare take down our electrical grid, any AI in America would most likely go down with it. Unless of course they've figured out how to harden themselves against such a threat in which case, well, ask helly-wood how that ends. NOTE TO READERS: With digital media revenue spiraling downward, especially hitting those in Independent Media, where attacks from every direction continue to hit, from the 'adpocalyspe' via YouTube, Google and other advertising services, to the MSM attacks against any outlet that doesn't toe the "official narrative," to social media shadow-banning and blocking anything from going viral if it questions that same official narrative, it has become apparent that traditional advertising simply isn't going to fully cover the costs and expenses for many smaller independent websites. Any extra readers may be able to spare for donations is greatly appreciated.